RE: FOIL Request For Records From the Secret Meeting Held At Tweed on 3020-a, February 24, 2015: Joe Baranello Says He Will Respond "Soon"
It was very nice to hear your opinion on student privacy at the NYC Bar on May 26, 2015. I enjoyed reading all the materials from that event! By the way, I am confused about your new title, "Chief Privacy Officer" of the DOE. Are you still the Chief Records Access Officer? Maybe both? What are the privacy tradeoffs when schools use cloud-based adaptive learning tools? Does current federal law (FERPA, COPPA) provide a sufficient framework for safeguarding student privacy and information security? How can service providers to schools use student data, and when are they required to obtain parental consent? What kind of data is "Student Record" data, and what constitutes a "legitimate educational interest" under FERPA? When is it permissible to transfer or make Student Records accessible to other school districts or third parties? Are there tradeoffs between enhanced privacy and furthering research that can enhance education? Do adaptive learning tools provide real educational benefits or are they just hype? How do the ADA and IDEA apply in the context of these tools? NY CLE Credit: 2.0 professional practice"
That being said, I am very appreciative of your information that when Courtenaye Jackson-Chase, the General Counsel, does not want/cannot answer an appeal of a Freedom of Information Law request (stated by you as "...in the absence of the General Counsel..."), the responsibility to issue a reply falls on First Deputy Counsel Judy Nathan rather than Chief Deputy Counsel Charity Guerra. See the email below. In your email you say you will get me the records sought in FOIL #11,129 "soon". I am so sorry to say that this word has no meaning for me, and I am currently suing you in NY State Supreme Court over your almost 2-year delay after I filed a FOIL request to obtain former Chancellor Dennis Walcott's contract, which similarly was on your supervisor's desk in your office. Respectfully, I must argue that soon is not soon at all, considering the fact that your boss, General Counsel Courtenaye Jackson-Chase, was the presenter at the February 24, 2015 meeting at Tweed on 3020-a proceedings and rules. "4. (a) Except as provided in subdivision five of this section, any person denied access to a record may within thirty days appeal in writing such denial to the head, chief executive or governing body of the entity, or the person therefor designated by such head, chief executive, or governing body, who shall within ten business days of the receipt of such appeal fully explain in writing to the person requesting the record the reasons for further denial, or provide access to the record sought." In good faith, I will extend my prior Notice of Claim filing date to June 6, 2015. Please give me the full price for all the original emails, documents, etc., used/sent/handed out at the February 24, 2015 meeting cited in FOIL #11,129 no later than June 2, 2015, at 5 PM. Please be advised that Penal Law §240.65 states:"A person is guilty of unlawful prevention of public access to records when, with intent to prevent the public inspection of a record pursuant to article six of the public officers law, he willfully conceals or destroys any such record. Unlawful prevention of public access to records is a violation." "8. Any person who, with intent to prevent public inspection of a record pursuant to this article, willfully conceals or destroys any such record shall be guilty of a violation." If I do not get the documents by June 4, 2015, I will assume that you are knowingly and deliberately hiding the records. In that case, you will be forcing me to pursue all my legal remedies. In response to your inquiry, I expect to have a response to you soon. In addition, to address a question you raised in previous correspondence, it is my understanding that the position of Chief Deputy Counsel was created in 2006. Please note that as long as I can recall, in the absence of the General Counsel, the designated Records Access Appeals Officer has always been the First Deputy Counsel (i.e., Judy Nathan) and not the Chief Deputy Counsel (i.e. (and in order since my start with the DOE in 2009), Courtenaye Jackson-Chase, Tracy Cooney and Charity Guerra). On March 17, 2015 I filed a FOIL request for all the documents , emails, etc., that were used or handed out to all NYSUT and DOE Attorneys, all Arbitrators and any other attendees at your February 24, 2015 meeting on 3020-a arbitration. You are playing games with the rights I have to receive this information by delaying any response, even my latest appeal, filed with you May 9. I agreed weeks ago to pay for the documents. It was your meeting, held in your offices! This email serves as Notice: on Monday June 1, 2015 I will be forced to file an Article 78 against you and your deliberate delay. I will also file a Notice of Claim to highlight the disparate treatment which seems to be a personal attack on me and my advocacy. Please resolve this before it goes any further and give me the information I have requested. Position Summary: Under the direction of the Deputy Counsel of the Department of Education’s (DOE) Legal Services General Practice Unit, the attorney engages in difficult and complex legal work having significant financial, procedural or policy consequences. Performs related work. Coordinates with and assists the Central Records Access Officer (CRAO) in implementing Department policy and legal mandates related to FOIL requests. Handles FOIL requests and appeals. Communicates with the press, government officials and other individuals on actual or potential requests and coordinates press requests with the Office of Communications and Media Relations. Provides ongoing technical assistance to DOE staff. Manages formal staff development, where needed. Maintains and utilizes an office database to monitor compliance, e.g., timeliness of responses, appropriateness of released materials, etc. Makes recommendations to the CRAO regarding FOIL appeals and assists with document redactions, as needed. Provides ongoing technical assistance on various subpoena and records issues, including FERPA, discovery demands for tort litigation and records retention, and assists with the supervision of the Subpoena Unit. 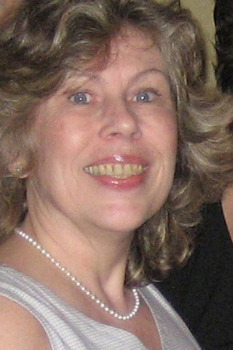 Prepares documents in response to court orders on subpoenas, and appears in court if needed. Coordinates with the NYC Law Department on strategy, papers and discovery in related litigation and recommends settlements and adjustments. Drafts rules and regulations for the Department of Education. Represents the DOE in employment discrimination cases and administrative hearings; provides advice on education law. Prepares Chancellor’s rulings on various grievance appeals and student suspension appeals. Coordinates with the Corporation Counsel’s office on papers and discovery in litigated cases, e.g., Article 78 cases involving termination and Title VII cases. Works on major class actions and policy initiatives. Interprets and responds to issues handled by the General Practice Unit including governance, FMLA, ADA, charter schools, student records, dress code, religious accommodations, search and seizure, after-school use of facilities, immunization, compulsory education, health issues, school trips, and home schooling. Confers with subject matter specialists, technical experts, and other attorneys, including counsel for litigants. Conducts legal investigations and examines prospective witnesses. Analyzes and reports on the effects of city, state, and federal legislation. Ability to rapidly understand provisions of applicable law and regulations. Sign the petition to get this person fired permanently from the NYC DOE. Give her a "problem code"
and keep her away from administering her hatred for the poor anywhere. It is shocking that the Department has not remedied this situation and has not permitted kind-hearted donors to give the "poor" kids a carnival. A carnival owner and other would-be benefactors — including a real-estate developer and the wife of an NBA star — want to throw a free carnival for all the kids at Flushing’s PS 120. But all week, Principal Joan Monroe, whose cold-hearted policy of excluding from the school’s May 21 carnival all kids who didn’t pay a $10 entry fee was exposed by The Post, did not return phone calls from people who wanted to make it up to the disappointed youngsters. The deep-pocketed donors included Gary Pincus, owner of Send in the Clowns, the entertainment company that staged the carnival, and Long Island real-estate developer Daren Hornig, who both offered to pay for a bigger and better carnival that would not cost any child a cent. It was only on Friday, after The Post contacted City Hall, that a staffer in the mayor’s Community Affairs Office finally called Hornig. Pincus said he will donate another carnival with the same seven rides, including giant inflatable slides, a bounce house and obstacle course, along with a DJ, games, ice cream and popcorn. Pincus, who puts on parties for the New York Mets, said team contacts have also offered to help, perhaps with a visit by their big-headed, big-hearted mascot, Mr. Met. All 1,000 kids in the school will be invited, Pincus said. Pincus said he charged the school a discounted $4,500 fee for the May 21 carnival. The parents association which sponsored the event made a profit of more than $4,000, which it said would pay for other school expenses. Many Post readers were shocked by the principal’s strict no-pay, no-play rule. About 100 kids were forced to sit in the auditorium within earshot of the music and shrieks of delight from outside — and some cried or thought they were being punished. Even kids who went were saddened because friends were left out. Nadia Bonner, wife of San Antonio Spurs star Matt Bonner, contacted The Post to find out how she could help. 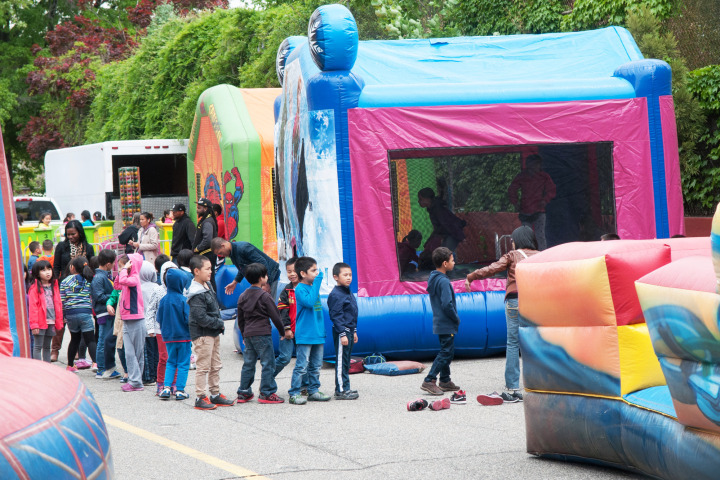 Department of Education officials would only say that the District 25 superintendent is “considering the proposal” to hold another carnival. “We are grateful for this generous offer,” said Department spokeswoman Devora Kaye . Kaye said excluding children from a school celebration because they didn’t pay violates ­department regulations. 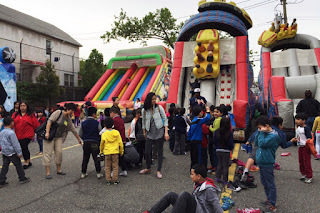 Meanwhile, the Chinese-American Planning Council and Queens Assemblyman Ron Kim announced Friday they will host a free carnival in downtown Flushing this summer and invite all area children. “The recent incident at PS 120 is simply unacceptable and we will not sit idly while all those children may be deeply traumatized,” Kim said in a statement. No party for the poor. PS 120 in Flushing held a carnival for its students Thursday, but kids whose parents did not pay $10 were forced to sit in the auditorium while their classmates had a blast. Close to 900 kids went to the Queens schoolyard affair, with pre-K to fifth-grade classes taking turns, each spending 45 minutes outside. The kids enjoyed inflatable slides, a bouncing room and a twirly teacup ride. They devoured popcorn and flavored ices. DJs blasted party tunes. But more than 100 disappointed kids were herded into the darkened auditorium to just sit or watch an old Disney movie while aides supervised — the music, shouts and laughter outside still audible. “It’s breaking my heart that there are kids inside,” one teacher said. “Are we being punished?” one child asked an aide in the auditorium as kids sat there with no movie playing, a staffer said. On Thursday morning, Monroe used the school loudspeaker to remind teachers to send in a list of kids who did not pay. While teachers were handed a bag of little stuffed animals to give kids who paid for the carnival, one withheld them until she could add her own gifts for the half-dozen or so kids in her class who didn’t go. The teacher hushed excited kids when they returned to class — some with bags of popcorn — after the carnival. She had them put it away and do a quiet activity, so those who took part in the fun couldn’t talk about it and hurt those left out. Another teacher was sickened by the inequity. Frank Chow, president of the parents association that sponsored the carnival, said Monroe insisted that kids whose parents didn’t pay could not partake. The carnival cost about $6,200, including fees to a carnival company, Send In the Clowns, and reaped a $2,000 to $3,000 profit, he added. “I wish we just charged parents the cost, not to make extra,” Chow said. The profit is earmarked for the pre-K, kindergarten and fifth-grade moving-up parties, he said. PS 120 families also have paid annual PA dues of $15 per family. That money will be spent on window air-conditioning units, Chow said. Monroe did not return calls and an email from The Post.